Travelling people are one of the biggest factors of pest migration. The cockroach for example was distributed throughout the world from its African and Asian origin mainly by vehicles of commerce and in luggage of travelers. One of the most commonly carried pests are Bedbugs; these little bugs are so tiny it is very difficult to spot them, and the moment they find their way into your luggage, that is a direct VIP pass to your clothes and bed. So you agree that people need a way to prevent bugs from getting into suitcases, backpacks and traveling bags or at least incenerate them once they get in. Introducing ThermalStrike Heated Luggage, the only luggage that promises to kill all living bugs within your luggage. The luggage uses a thin infrared radiation system to terminate the bugs, so be sure to plug it into a wall socket when you’re done packing to begin the massacre process. It only heats the inside up to 1400F (600C), so your belongings are totally safe. It has an indestructible polycarbonate shell, toughened telescopic aluminum handle, reinforced corner guards, and an integrated TSA-approved lock. 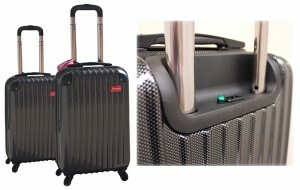 You can buy one of two sizes of the ThermalStrike Heated Luggage or both from the ThermalStrike website. The 20inch luggage costs $199 while the 24inch variant costs $249, or you can get a set of both for $399.